When we a talking about Big Data we may mean huge amounts of data (high Volume), data in any format (high Variety), and streaming data (appearing with high Velocity). Volume: need to store and query hundreds of terabytes of data, and the total volume is growing. Processing systems must be scalable to handle increasing volumes of data, typically by scaling out across multiple machines. Variety: situation when data do not match any existing data schema, semi-structured or unstructured data. 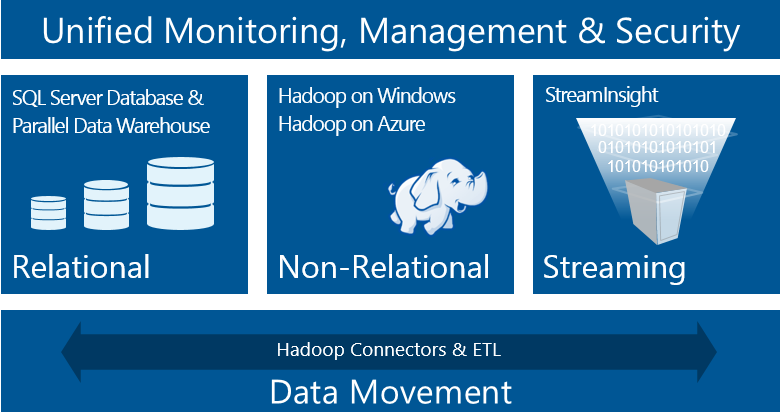 Microsoft provides solutions for all of these “3V” tasks under unified monitoring, management and security, as well as unified data movement technologies. These workloads are supported correspondingly by solutions for Data Warehousing (DWH), Complex Event Processing (CEP), and NoSQL.